Wednesday night's (November 30) performance from Karen Andersen — better known as MØ — at Montreal's Corona Theatre put two different versions of the Danish synth-pop singer on show: "Party MØ," and the softer "Singer-songwriter MØ." The flipping between the two styles was almost switch-like. Unfortunately, despite proving herself a magnetic and capable performer, that lack of a continuous stylistic thread put something of a dent in the show. MØ burst onto the stage with a multi-layered take on one of the many singles from her debut album No Mythologies to Follow. "Don't Wanna Dance" is one of the most pop-leaning tracks on the album, but it started with a simple drone, adding on crisp but soulful vocals to resonate through the theatre. 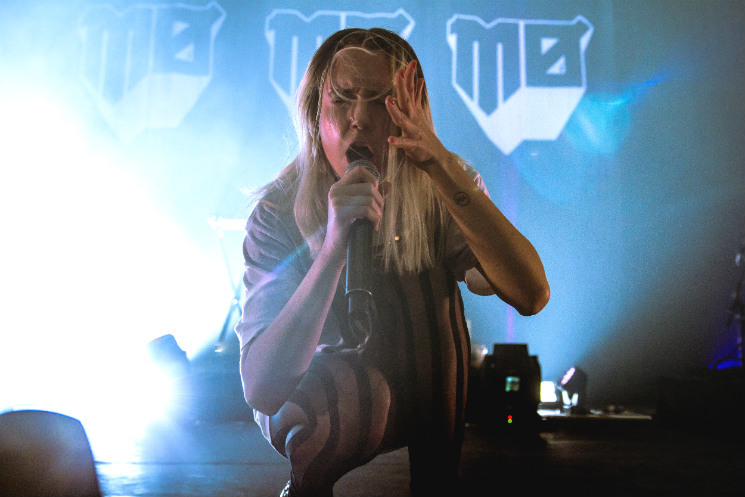 It was an unambiguous demonstration that MØ wields the very desirable skill of sounding better and demonstrating more vocal range in a live performance than on a studio recording. This was peak Singer-songwriter MØ. The next track, "Waste of Time" was Party MØ's first outing, where her R&B and pop stylings shone through more — then it was back to more vocally oriented, ballad-esque Singer-songwriter MØ again on track three, "Slow Love." And so it alternated for most of the set. MØ was most successful when her voice was front-and-centre. One song in particular, "Fire Rides," showcased MØ's voice perfectly; with just the right husky edge on her voice, the song sent shivers up the collective spines of the audience in its stripped-back beginning. A successful build-up made it a true highlight: Both sides of MØ were neatly and successfully reconciled. And "Lean On," her mega-hit with producer Diplo and DJ Snake, was a straight-up banger of a closing track. But overall, the tracks that prioritized beats, synths, and dancing over MØ's voice (that is, songs in "Party MØ" mode) tended to be a little weaker — at times her vocals were simply lost in the volume, and the multi-dimensional feel that songs like "Fire Rides" had were absent. There were exceptions, though: her boppy take on "Pilgrim" was a joy, and "Final Song" successfully balanced strong vocals with eminently danceable instrumentation. This shouldn't be taken as a suggestion that MØ should simply stand around crooning, leaving the dancing or fun aside — she doesn't exist solely in the silly, made-up "singer-songwriter" genre — but Party MØ needs to be either amped up, or that pop approach needs to be better blended with her vocalist side. Still, MØ had great energy onstage, and a warmly stunning voice — I suspect she'll ably merge both sides of her performance soon.